Record your family tree using the Made in the USA family star collection. 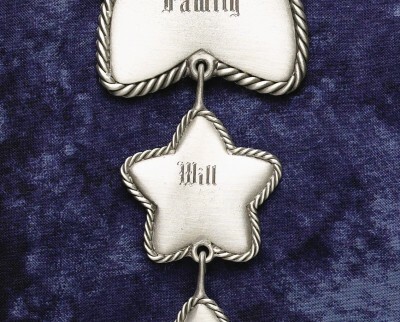 Engrave the big star with your family surname, then add as many stars as needed for each family member. This can be hung on your Christmas tree or displayed proudly anywhere in your home year-round. It makes a great gift that you can continue to add to in case of any family additions! Don't forget to check out our Bone Charm for your furry friend. It is engravable and makes the perfect bottom piece of your set. Price includes 2 lines of engraving. 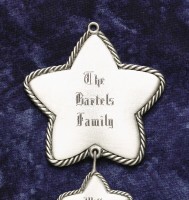 Our small family star has a hook on the top and a loop on the bottom to add as many members and pets to your family as you need.